Welcome to Blossom Street, a spot in Seattle where you can find anything you need, from flowers and yarn to friendship and a fresh start. 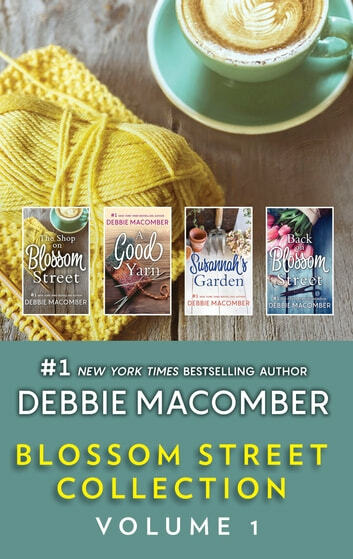 Now in a 4-in-1 box set, this collection of beloved stories from #1 New York Times bestselling author Debbie Macomber will delight you! A Good Yarn is a place of welcome and warmth, friends old and new. Lydia has fallen in love with Brad Goetz, but then Brad’s ex reappears, and Lydia is suddenly afraid to trust her newfound happiness. Meanwhile, three women join her newest class—Elise Beaumont, Bethanne Hamlin and Courtney Pulanski—and soon they form an unbreakable bond as they listen, learn, and help each other solve their problems. 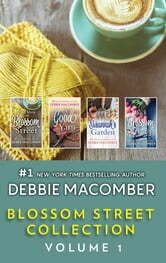 B***ack on Blossom Street,*** Susannah Nelson, owner of Susannah’s Garden, has just hired an assistant named Colette Blake, a young widow who’s obviously hiding a secret—or two! When Susannah and Colette both join Lydia Goetz’s new knitting class, they discover that Lydia and her sister, Margaret, have worries of their own. Margaret’s daughter, Julia, is the victim of a random carjacking, and the entire family is thrown into emotional chaos. Then there’s Alix Townsend, whose wedding is only months away. She’s not sure she can go through with it, though. But, like everyone in Lydia’s knitting class, Alix knows there’s a solution to every problem…and another woman can usually help you find it!